Schon has spent the last 30 years of his working life in the City of Parramatta and has had a strong connection to the City and its people, particularly in the business world. Schon feels passionately about the growth and development of both this City and the Greater Western Sydney region. He has been a strong supporter of the Parramatta Chamber since his arrival and has a great deal of experience to offer the organisation. Schon is well-known in Parramatta and is involved in numerous charities, including, The Salvation Army - Red Shield Appeal (Parramatta based), Legacy and The Order of Saint John. Schon is a member of the Australian Army Reserve holding the rank of Lieutenant Colonel, formally commanding 23 Field Regiment, RAA. Schon is the Managing Principal of Condon Associates. 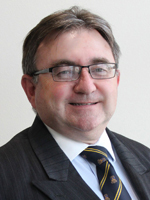 He holds a Bachelor of Business degree, a Grad Diploma in Management, and is a Fellow of CAANZ, CPA and the IPA. He holds numerous professional qualifications and registrations and focuses on the growth and revitalization of businesses and financial issues.